If you're looking for the best free anti-malware software for Windows – whether it's a whole new security package, or just an additional program to give your regular antivirus a boost – then you've come to the right place. Here is our definitive list of the best free anti-malware software, and choosing the right software for your needs is essential, as malware continues to be a threat and a concern for us all. It's not just viruses we're talking about here, but also annoying programs such as adware, that can embed themselves in your web browser and add toolbars or change you homepage. Not only are these annoying, but they also pose a serious security risk. Getting the best antivirus you can is an excellent first line of defence for your PC, but it's often a good idea to install additional anti-malware software to boost your protection from a more diverse range of threats. Alternatively, you could replace your existing security software with a whole new suite designed to protect against all kinds of malware - see our best free antivirus software. Otherwise, read on to find out our pick of the best free anti-malware software you can download. With any of these installed, you'll be able to browse the internet with confidence. Bitdefender Antivirus Free Edition is the strong, silent type. This anti-malware software doesn't even ask questions when you install it – it just quietly gets on with the job of identifying and eliminating anything that poses a risk to your safety and security. It watches out for apps behaving badly, scans links on the web to identify scams, and has proactive malware and spyware scanning that can detect threats nobody has encountered before. Plus the app boasts boot scanning every time you start your PC. Ad-free, nag-free and hassle-free, Bitdefender Antivirus Free Edition is a great product that runs quickly and silently while you get on with something more interesting. 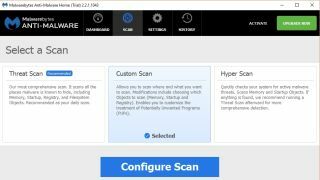 Its comprehensive suite of tools to protect your PC makes Bitdefender the best free anti-malware software you can download today. It's all the protection you need in one handy package. If you're looking for anti-malware software that keeps quiet and won't disturb your work, be warned – AVG Antivirus Free is quite vocal with its notifications, and irks us from time to time with pop-ups telling us we've done something fantastic with regard to our online safety. As an anti-malware app, though, it's very good. The dashboard is user-friendly, there's protection not just from downloadable threats, but from dodgy links too, and you can use your mobile to scan your PC remotely, which is pretty clever. The paid-for Pro model has more security options - it has more robust download protection, offers data encryption includes a firewall - but the free version offers decent protection for most PC users. You can use Malwarebytes Anti-Malware free for as long as you like, but there's an important caveat: real-time protection, the fast 'hyper scan' mode and malicious website blocking features all expire after 14 days - and that means you're missing out on some of the program's best features. Malwarebytes has a deserved reputation for destroying malware and spyware that other programs miss, and its chameleon technology - which once again expires after a fortnight in the free version - means it's less susceptible to attacks that deliberately target security software. Think of the free version as a short-term savior or a test drive; the Premium version costs £29.95 (about US$40) per year. SpyBot Search & Destroy is a veteran of the malware wars, dating back to the first adware in 2000, and while it doesn't scan for viruses – that's in the Home version, which is $13.99 (about £10, AU$20) – the free software does a decent job of finding and fixing adware, malware and spyware. It's more of a system repair tool than a system protection tool, however, and you need to be careful where you get it from: there are fake versions in circulation designed to cause damage, not fix it. The version linked here is the real deal. Most security software tries to stop malware and spyware getting onto your system. Emsisoft Emergency Kit doesn't: it's the 911 call of security software, the app you use when your PC's been poked by something unpleasant. It's designed to be portable – an anti-malware app you carry around with you on a USB stick – and its system requirements are tiny: just 200MB of RAM, so it'll run happily on any PC with 1GB memory or more. With two million malware signatures, Emsisoft Emergency Kit can restore almost any infected PC to rude health.